Gona was the site of a Church of England mission which served nearby villages on the north coast of Papua. On 21 July 1942, Japanese ships anchored offshore and began landing troops and supplies east of the mission. This was the beginning of their plan to take Port Moresby with a two pronged attack, by advancing on land from the north coast of Papua and by landing from the sea in the Milne Bay area. 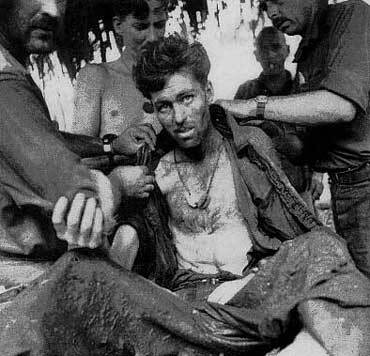 These advance troops were to go to Kokoda and reconnoitre the route for the larger force to follow. This force, from the South Seas Detachment, consisted of some 2,000 soldiers with 1,200 natives from Rabaul. 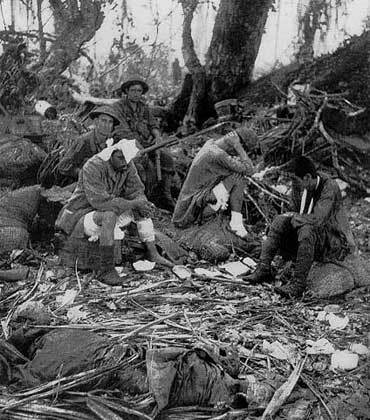 By the afternoon of 23 July, the troops, using well-marked tracks, were approaching Wairopi, some 50 kilometres inland. After brushing aside a company of the 39th Battalion, the enemy advanced on and took Kokoda, sending back a favourable report. Following this, the 7,000 to 8,000 main body of the Japanese Detachment landed at Gona and their advance towards Port Moresby which was finally halted at Ioribaiwa. The Japanese then withdrew north to the beachheads from where they had come. Under Japanese fortification specialists, Gona’s defences were constructed of coconut palm logs with good overhead cover and then cleverly camouflaged. Fields of fire were cut and, apart from the protection of swamps around the landward side, the kunai grass had been cut to the ground to force attackers to advance without cover. The consummate skill of the defence plan was reflected in the layout of mutually supporting strong posts and communication trenches which enabled the defenders to confuse attackers by quickly changing the points of origin of fire. The Japanese defenders were highly indoctrinated with the code of Bushido and their leaders had impressed upon them that surrender would bring shame upon them, their families and their Emperor. The 25th Brigade led by Brigadier Eather and including the 3rd Militia Battalion, depleted and tired, reached Gona on 19 November with “Chaforce”, which had been placed under its command at Wairopi. The Brigade, led first by the 2/33rd Battalion, launched several attacks, some were supported by air attacks and artillery, but the Brigade suffered heavy losses and by 26 November were restricted to patrol activity. On 28 November, the 21st Brigade under Brigadier Dougherty began to arrive and was joined by the 39th Battalion which had been partly reinforced after its gallant fighting withdrawal across the Owen Stanley Ranges. On 29 November, the 21st Brigade attacked Gona strongly from the east and gained control of the landing beach. The 21st and 25th Brigades contained Gona until 4 December when the 25th Brigade was withdrawn and flown back to Moresby. In a series of attacks, bunker by bunker, the four battalions annihilated the enemy.The final composite attack by the 2/16th and 2/27th Battalions led by Major Sublet and the 39th Battalion under Lieutenant Colonel Honner gave rise to the famous signal by Honner, “Gona’s gone”. By this time significant Japanese forces, which landed at night at the Mambare River, were between Gona and the Amboga River. Lieutenant Haddy’s Chaforce had harassed them inflicting casualties. Lieutenant Haddy, ever leading from the front, remained to the last and was killed. On 7 December, a 2/14th Battalion patrol was joined by the remainder of the Battalion and took over responsibility for the area west of Gona to the Amboga River. This force was joined by the 39th Battalion on 10 December and the Japanese were finally eliminated on 18 December when 170 were buried at Haddy’s village. 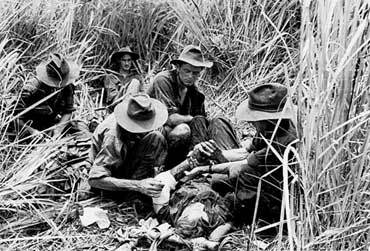 The victory at Gona cost the Japanese defenders over 800 dead; however, the Australian cost was excessively high. Total Australian casualties numbered 893, with the 21st Brigade and 39th Battalion suffering the heaviest losses. Mopping up in the Gona area was done by the 36th Battalion in the West and by the 55/53rd Battalion in the East, which also dealt with stragglers escaping from Gona and Sanananda.